I just finished a walnut bed frame with live-edge walnut slab headboard. It was my first time working with live-edge wood and the results were fantastic, I must say (and so does the customer!). The bed frame itself was made of a lower grade of walnut which meant it had knots and the wood cost about 30% less and the headboard was a solid slab from a locally-grown and milled tree with both live edges intact. The finish was shellac with beeswax over the top coat and the front face of the headboard was sanded to 1200 grit, making it feel as smooth as glass! There was some pretty significant figure around the central knot in it (photo to the left). 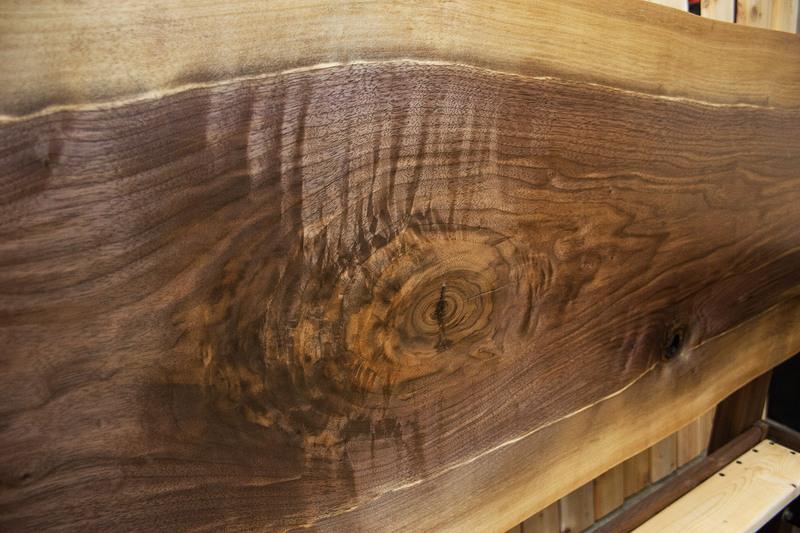 You can see more photos of this creation in the walnut section of this page. When we say that we do custom work, this is one example of what we mean.